In most instances, starting a motorcycle engine is a simple procedure. There are variations in starting the engine depending on your type of motorcycle. These engine starting variations detailed within this section are intended to be a general guide only and some motorcycles may require slight alterations to these techniques in order to start the engine. Before getting on your motorcycle, for reasons of safety, it’s important that you use the correct mounting and dismounting techniques. Ensure the gear selector is in neutral. 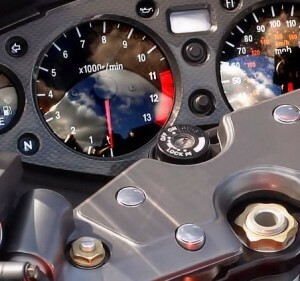 If your motorcycle has a neutral light indicator, this will illuminate to inform you that neutral has been selected (see motorcycle dash lights for further information). Certain older or more basic motorcycles may not have a neutral indicator. If yours doesn’t, simply push your bike forward to see if the rear wheel turns freely and easily. If the motorcycle is difficult to push, this indicates the vehicle is still in gear. Fuel / petrol tap, or petcock as it is also referred to, is a valve that is used to control the flow of fuel. Not all motorcycles are fitted with a fuel tap. If yours is, ensure it is turned to the ‘on’ position. Some motorcycles are fitted with a choke. A choke alters the fuel mixture in the engine, making it richer and easier to start. Motorcycles that do not have a choke utilise on-board computer management systems that alter fuel mixtures automatically. If your motorcycle has a choke, ensure it is set to the ‘on’ position, or pulled all the way out. This is only necessary if the engine is cold and the choke should not be used when attempting to start a warm engine. How long to leave the choke on a motorcycle? The engine cut-out, or kill switch as it’s also known is a method to quickly and easily turn the engine off during an emergency. Ensure the cut-out switch is in the ‘on’ or ‘run’ position. Turn the ignition key to the ‘on’ position and apply the front brake. Your motorcycle should now be ready to start. The next process depends on whether it has a kick starter or an electric starter. The kick start lever will be tucked away so you will need to pull it out. The footrest may need to be folded up before the kick start lever can be fully extended on certain models. Remember to check the bike is in neutral, else it may lurch forward abruptly when started. Place the ball of your right foot onto the kick start lever and firmly and briskly push down. Repeat if necessary to start. If you are finding it hard to push the lever, keep the motorcycle on its side-stand and use your body weight to kick start. Press the stater button and once the engine has started, release the button. You may need to apply throttle once started for a short time. When the engine has warmed up and is running smoothly, set the choke to the ‘off’ position. Shutting off a motorcycle engine is a similar procedure to most motorcycles.